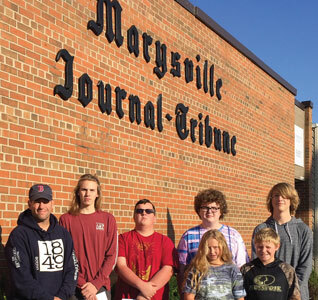 As part of National Newspaper Carrier Week, the Marysville Journal-Tribune recently honored several of its best newspaper carriers. Each one has more than two years delivering the paper and received high praise from the customers they serve. Pictured above with Publisher Kevin Behrens, left, are carriers, front row from left, Cecillia Archer and Kage Moss, and back row, from left, Ethan Shaw, Brady Dawson, Hayden Cantrell and Ian Mitchell. Those interested in serving as a carrier for the newspaper or with comments about their newspaper carrier are invited to contact circulation manager Cheryl Welty at (937) 644-9111.